In my last post in April I discussed a potential top in the Stock Market. As of early June 2017, this Market has not topped out. I am here to remind my fellow readers, do not let complacency get the best of you. If anything in the last 2 months Market conditions have gotten worse. 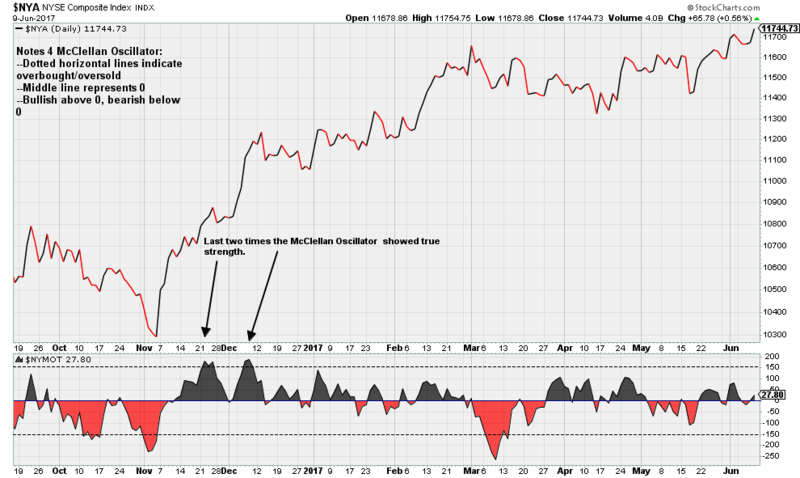 The stock chart above is the McClellan Oscillator, which is used to determine the overall strength and liquidity for the Stock Market within a medium term time frame (months). As the Market continues to go tread higher, this indicator has not confirmed these "highs". Meaning, there is a high chance the market will be susceptible to a significant correction. What would one expect from this indicator is for readings above 150 to hit at least for a few days. The issue is, this indicator has not shown strength for a very long as shown in the chart above. 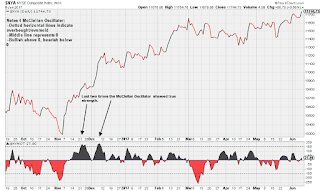 The last time this indicator confirmed true strength of the Market was back in December 2016 (by which the Market proceeded to go on a bullish tear in 2017). In short, until this chart shows bullish confirmation (hitting readings above +150 comfortably), I would be very hesitant of investing in the long/medium term when it comes to this Market.